Spring is almost here, and that means it’s time to freshen up your home and get ready for what the rest of the year has in store! While you start making your list of things to do, why not incorporate some fresh new design trends? There are a variety of ways you can incorporate new trends in your home whether it’s updating your existing home or building new construction. From finishes to furnishings, your options are endless! 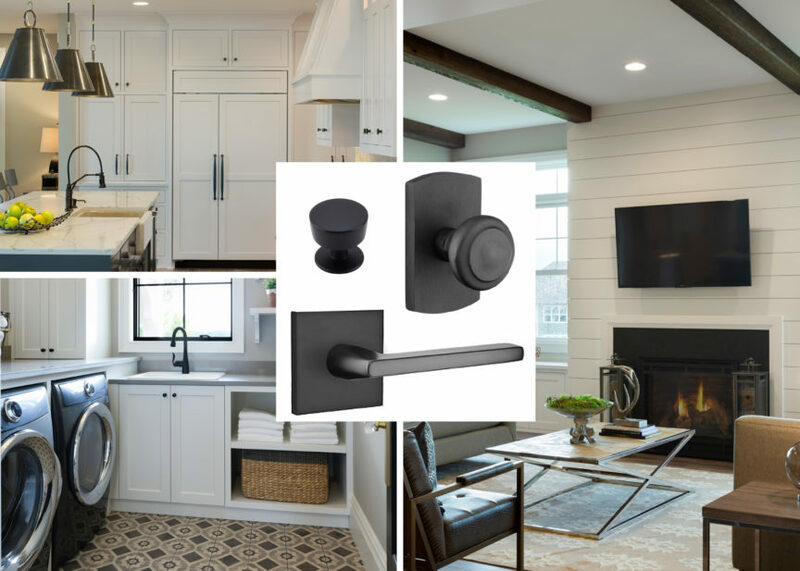 Our in-house designer, Danielle Matthies, has put together five 2018 design trends to watch for as the year continues. MATTE BLACK FINISHES – Last year, satin brass took over the industry. 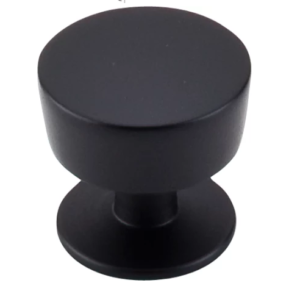 Although satin brass is still very popular, we see an increase use in matte black finishes. Matte black gives a statement-making look that can complement multiple materials and styles. 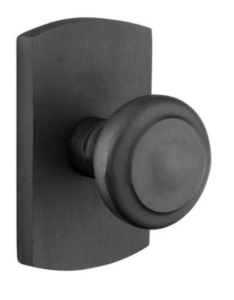 A quick update to your cabinet hardware or lighting can be an easy way to incorporate this trend in your home. PATTERNED TILE – We embrace all tile shapes and sizes, but are really excited about cement tiles this year. Cement tiles offer elaborate colors, while a porcelain look may be a bit more limited. In 2018, we plan to see more use of patterned tiles as opposed to solid options. 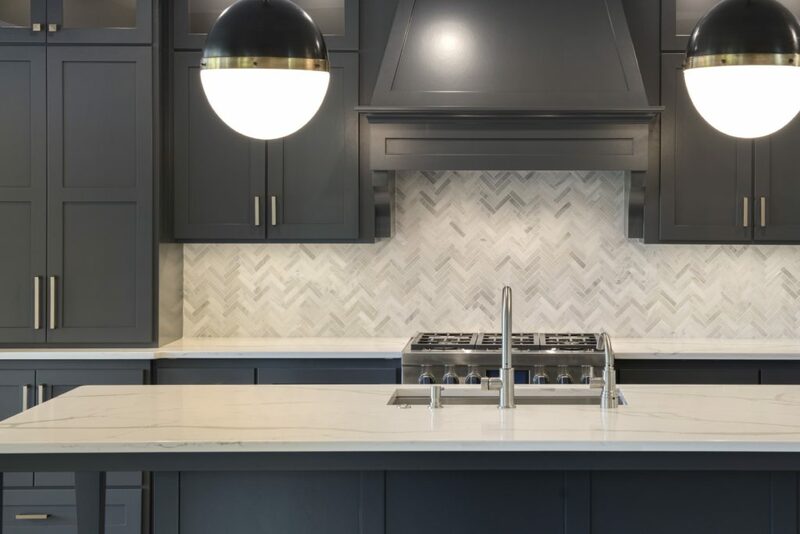 Whether used for a kitchen backsplash or flooring in bathrooms, resource areas, or laundry rooms, keep your eyes peeled for some really cool options! You can even change the look by selecting tiles in different materials like ceramic, stone, metal, or glass. 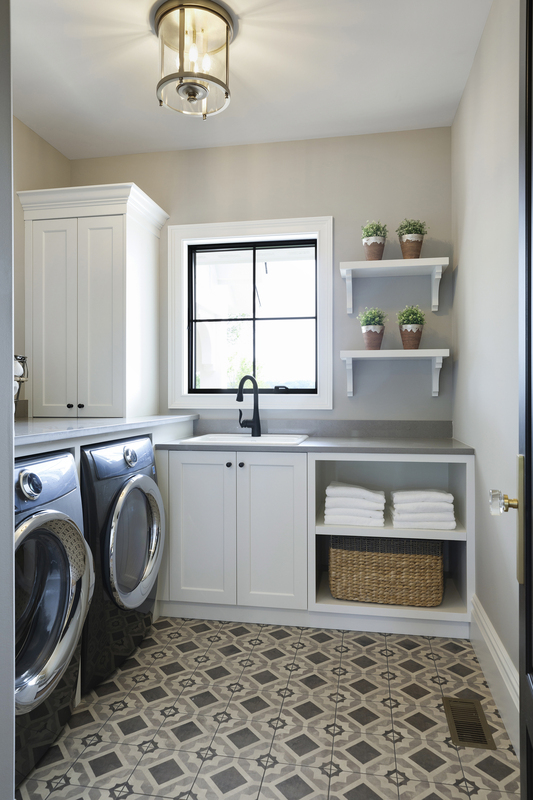 Check out our recent tile trend blog for more information. WALL COVERINGS – Accent walls are a great way to add flare to your home. A common wall accent is splashing a different paint color on one of the walls in your space, but industry trends are showing us all sorts of additional wall covering options! We’ve seen wallpaper make a come-back the past few years with decorative patterns and floral prints. 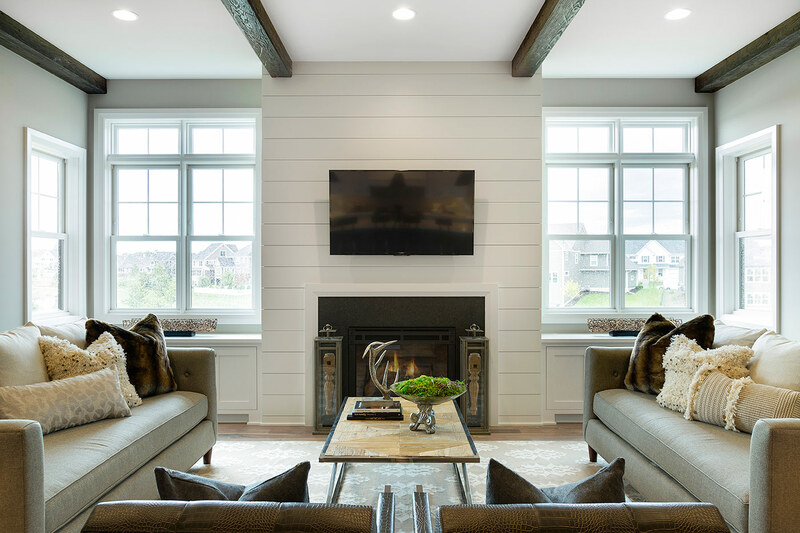 We are also seeing an increased popularity in millwork feature walls and details like wainscot, paneling, ceiling designs, reclaimed wood, and yes…still shiplap! 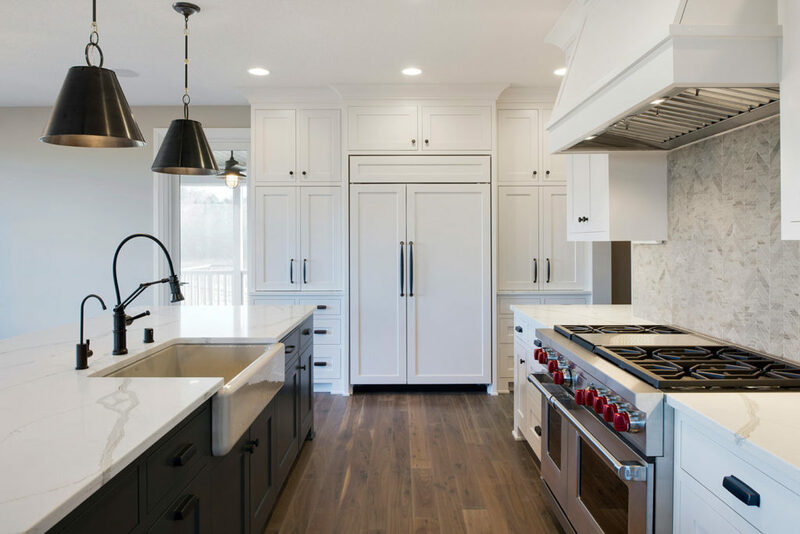 COLORFUL KITCHENS – The clean, bright look of an all-white kitchen will always be a popular trend; but this year, we anticipate seeing bolder color choices in kitchen cabinetry with grays, stains, distressing, black and even BLUE. Sometimes the hardest part about designing your kitchen isn’t finding a look you like, but rather choosing just one! In that case, we are seeing some two-toned kitchens with cabinet frame one color and the inside box/panel another or accenting the island or side buffet in a different color cabinet than the rest of the kitchen! APPEALING APPLIANCES – We anticipate an increased use of paneled/invisible appliances or more discreet finishes like matte black or charcoal! Appliance manufacturers have come out with touch appliances that don’t require hardware pulls or knobs to open the doors of the appliance! Not only can paneling or upgrading your color/finish make your kitchen look larger, but it will make the space look more appealing as well!